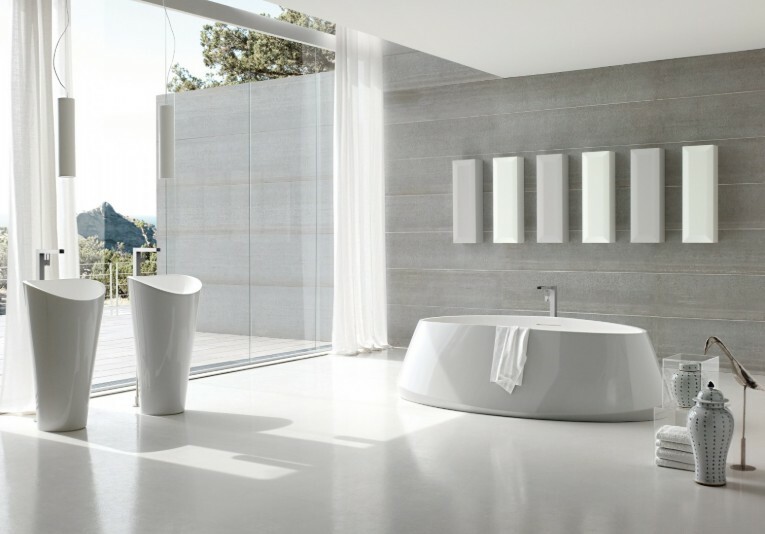 What’s Hot in Bathroom Design? Home / Bathrooms / What’s Hot in Bathroom Design? If you’ve decided to renovate your bathroom at home or at your short-term rental because you either want to sell your home and get more money or simply want to enjoy a modern, functional bathroom for the years to come, you are facing a complex project. Naturally, the result will largely depend on your budget and ideas, but you need to know that a complete overhaul isn’t always necessary. Also, since you want to have a fashionable bathroom, you need to be aware that trends in bathroom design change constantly and you’d better be familiar with the current trends and even anticipate what will be fashionable in the near future. So, let’s take a look at the suggestions put forward by some of the most renowned interior designers. If you are blessed with a large space, and many Australian homeowners are, you’ll have so many options to choose from. You can use the bathroom not only for hygiene, but as a space of relaxation as well. Those who don’t have to keep the washer and dryer in the bathroom can really turn this room into a beautiful nook. However, be careful not to use the space to store all the furniture items you don’t want in other parts of your home. The bathroom has to be functional and you won’t achieve that if you turn it into a large storage space. Your bathroom has to be maintained well and it should not contain anything that doesn’t serve a particular purpose. The secret is that clean and uncluttered spaces look bigger than they actually are and you don’t want to feel claustrophobic in the bathroom. Even though minimalism is very popular, you can always sprinkle it with a touch of style and elegance by using colourful patterns, particularly in the tiles. Australian designers also recommend using tiles of different sizes, for example. There are now many popular options for your shower, but many of them focus on functionality. That means that there are benches, steam systems, shower columns and similar features that really make this room stand out. Open shelves or holes to keep your soap, gel or shampoo are an inevitable part of every modern bathroom design. Vintage freestanding tubs are still standing strong, but you should only opt for this option if your bathroom is really big enough. Consider installing an island next to it and be brave with its shape, but make sure your pipes are properly installed and maintained by a professional, such as this reliable Perth plumber. If you like industrial design, you’ll be glad to hear that many interior designers are pushing this idea. Although many people associate is only with a loft in New York, there is no reason why your home in Australia shouldn’t feature this design. Use imperfect pieces that are unique, such as metal bathtubs and sinks, brick walls, etc. to achieve this effect. Mirrors with LED lighting and taps with a motion detector or temperature regulator are just some of the features that combine elegant and classy design with modern technology. You can also consider installing a towel dryer over the bathtub to save more space. Wood is back among the most popular options, since it provides a touch of natural environment and classic design. Just make sure you choose the right type of wood for the floor. You need wood that can breathe well and absorb moisture and you should always get rid of any water that remains when you exit of the shower. If you want to have an open shower, but still provide some privacy, you can install a wall featuring a sink or toilet to conceal the shower. Another option is to have a glass partition, which provides less privacy, but definitely makes the room look more spacious. Colours are extremely important in any design and bathrooms are no exception. Black and white are always fashionable, since black oozes a modern look, while white is all about classic. Still, you can also use other colours and still be fashionable. On the other hand, neutral colours go extremely well with natural materials, such as stone, glass and wood. If you opt for those colours, you can expect your bathroom to become the perfect place for relaxation, where you can enjoy calmness. Another option is to create strong accents by using striking colours, such as orange, pink or red. They are full of energy, so you have to make sure to use them with caution. Green, for example, will make the space look fresh, but you have to be careful with the hue you choose. Gold and silver are also often found in modern bathroom designs, since they make the space look much more sophisticated. Most designers, however, restrict these colours to fixtures and accessories. Natural materials are always fashionable. Stone used on walls with mirrors really looks neat, but glass and wood can also find their space in modern bathrooms. Their versatility is particularly appreciated, since you can use them in walls, floors and furniture with equal success. Turning your bathroom into a space that is not only more functional but also much more appealing can add so much to the overall feeling, so don’t waste the opportunity to create a state-of-the-art bathroom at your home.